Have you ever taken the first bite of something and thought to yourself, “that’s the best insert food item here I’ve ever had?” I’m talking about one of those bites of food that stop time. That’s what happened to me the first time I tried baking bacon in my Traeger and added rosemary to my spice blend. The end result was clean, sweet, and smooth with an extra layer of flavor that took everything over the top. 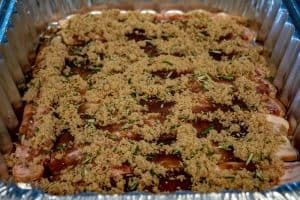 If you’ve tried making bacon candy you know what good bacon tastes like. 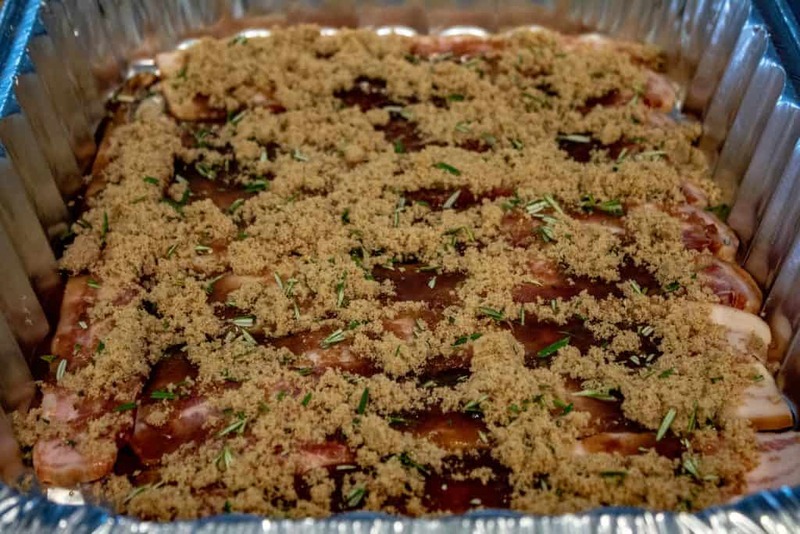 I think you’ll be pleasantly surprised when you try this method of baking bacon in your smoker. 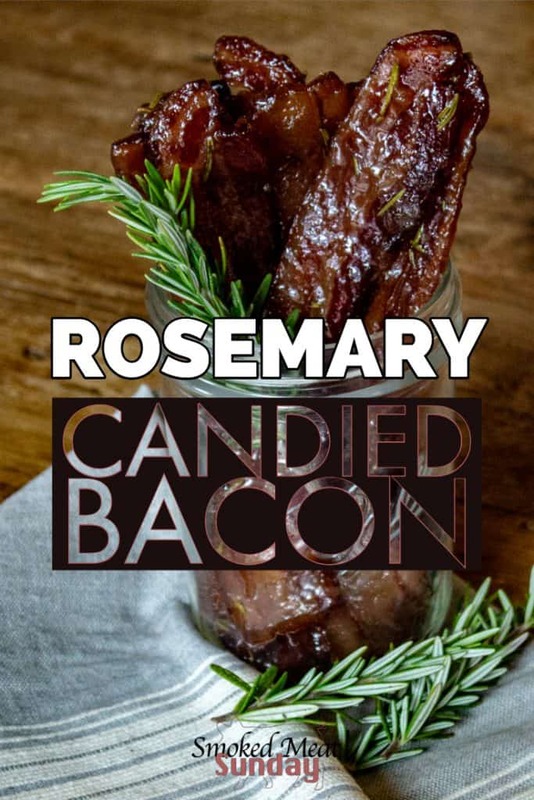 I might even argue that this Rosemary Candied Bacon is better than bacon candy. Before we get to the tasty part of this smoked bacon recipe, let’s talk about selecting the right bacon. I like to know where my meat comes from, and that’s why I appreciate the bacon I can get from ButcherBox. 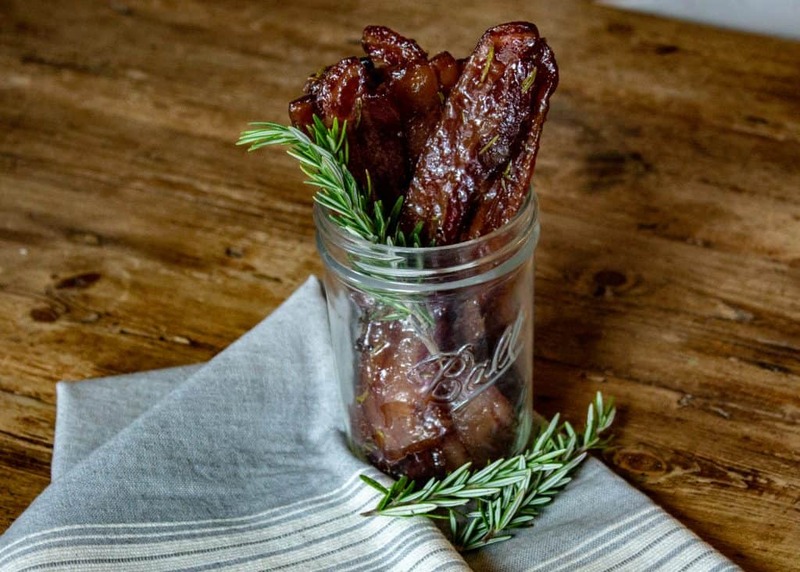 ButcherBox Bacon is sourced from slow-growing, minimally processed pigs. If you’re trying to avoid nitrates, ButcherBox bacon is perfect for you! Baking Bacon in your smoker at low temps turns out best when you select thick sliced bacon. Thinly sliced bacon is ok, but the thick stuff has the extra fat that turns into a party in your mouth after taking on a few hours of smoke. In a large bowl combine 2 cups of brown sugar, a 1/4 cup of fresh rosemary, 2 tbsp of black pepper, and a tbsp of kosher salt. Mix the ingredients together with a fork and then set aside. 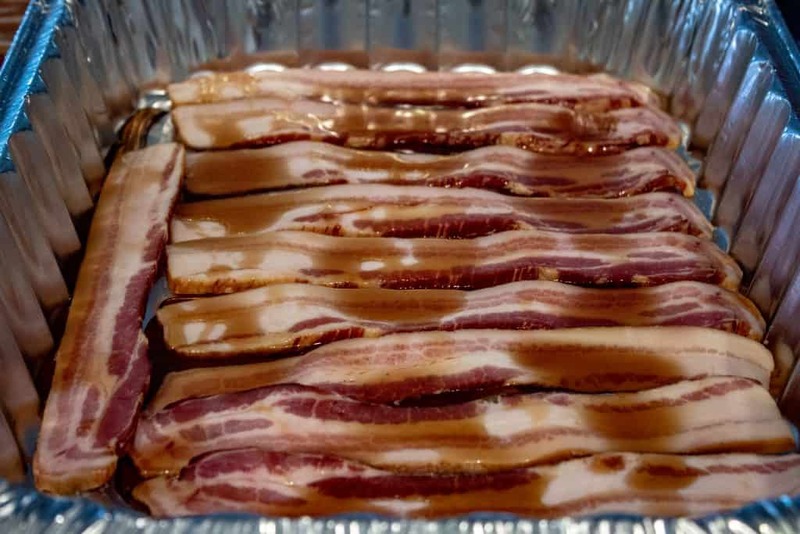 Line a cookie sheet with foil and lay your bacon slices parallel to one another, careful not to have any slices overlap. Pour a cup of maple syrup in a small bowl. Generously brush all of the slices of bacon with syrup. After all of the bacon has been brushed, liberally cover the bacon with your dry ingredients. 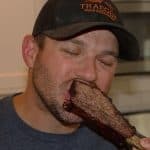 People don’t realize just how versatile a Traeger is… I love my Traeger because I can literally make anything that can be made in the oven, in the Traeger! 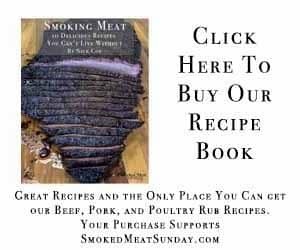 Get your smoker rolling, and get the temp up to 225 degrees. Put the pan of bacon in the smoker, and let it cook for one hour. After an hour remove the pan from the smoker and flip each of the slices of bacon. Sprinkle the remaining dry ingredients on the bacon, and put the pan back in for another hour. Once the bacon has cooked for two hours and thirty minutes, remove the pan from the smoker, and place all of the slices on the cooling rack. Once they have cooled they will firm up. Take a few bites, and then invite your friends and family in to enjoy the rest. This is the best bacon you’ve ever made. 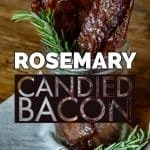 This rosemary candied bacon only requires a few ingredients, and is really easy to prepare! Pour a cup of maple syrup in a small bowl. Generously brush all of the slices of bacon with syrup. After all of the bacon has been brushed, liberally cover the bacon with your dry ingredients.